The farmhouse used by both Confederate and Union troops for headquarters and hospital, still stands in Cobb County, Georgia. These pictures, taken by photographer Andy Sharpe, are used here by permission of the Atlanta Journal-Constitution and were published in their July 3, 2003 East Cobb section. 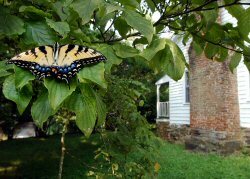 A tiger swallowtail occupies some leaf space in this Wednesday 6/25/03 photo taken on the historic Wallis House property, located on Burnt Hickory Road near Barrett Parkway. The Wallis house is shown at back right. Click on this thumbnail to view a larger image. This historic marker sign, near the Wallis House property,is located on Burnt Hickory Road near Barrett Parkway. The Wallis house is shown at back right. Officials at nearby Kennesaw Mountain National Battlefield Park want the property taken in as part of the park service. 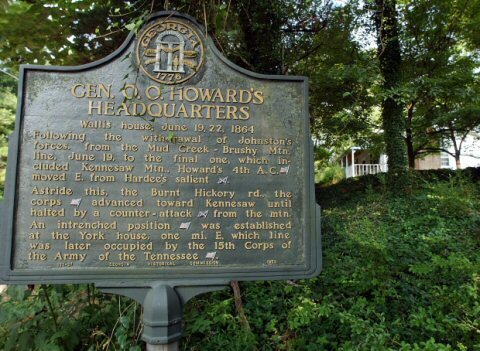 During the Civil War, the house that once belonged to the Wallis family was occupied by Union General Oliver O. Howard . Howard University was named after this Civil War general. The house was builit in 1835 and 1836. Click on this thumbnail to read the actual historic marker outside the Wallis House. The home and property are currently owned by the National Park Service.